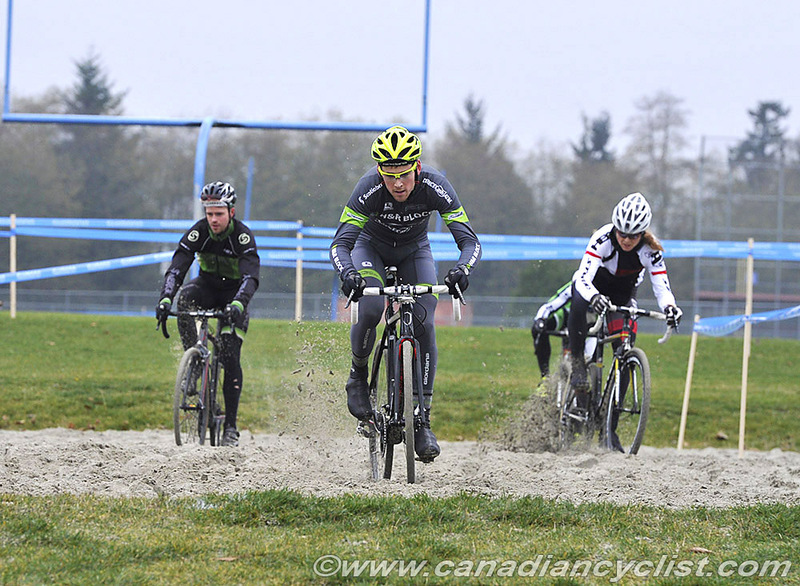 Today was the first chance for riders to try out the circuit that they will race on tomorrow for the Hansen Industries 2013 Canadian Cyclo-cross Championships in Surrey, BC. By all accounts it is a circuit that should see some exciting racing. Geoff Kabush (Scott-3Rox), the defending Elite men's champion, said that the 2.9 kilometre course is "a hundred times better than last year". He says that it contains many more technical features and will require riders to use real cyclo-cross skills. Kabush also said that there are many spots where a mistake will allow gaps to open, and that the race could easily be lost if someone makes a mistake and allows a gap to open. The course makes use of school grounds just south of last year's venue. Starting next to the football field, the riders head all the way around the perimeter to start. After this, the course consists of alternating long power straightaways and technical sections, including three separate deep sand pits, a set of stairs, a tight series of zig-zags and a pair of barricades. 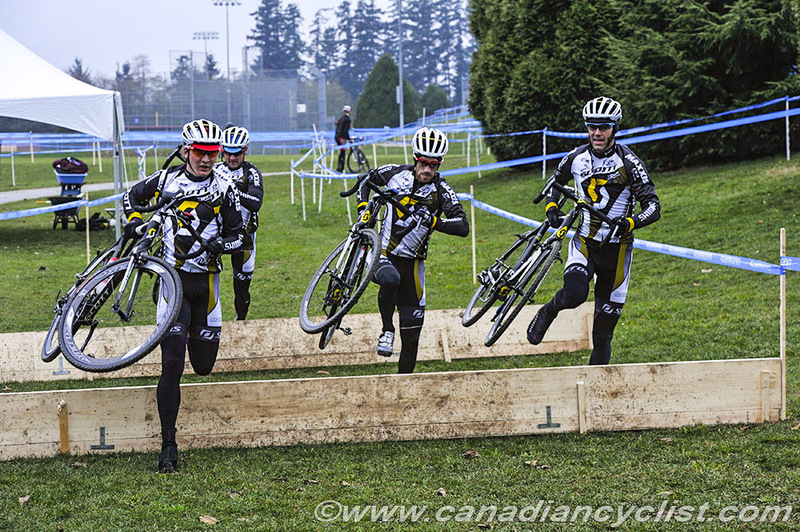 The Hansen Industries 2013 BC Grand Prix of Cyclo-cross UCI race on Sunday will use essentially the same course. Today it was not raining, but the ground is pretty waterlogged, so tomorrow's expected rain should turn it into a slippery, rutted mess. The Under 23 men's race is pretty open, with Ontario champion Peter Disera (CSAJCC p/b Norco LG) missing due to school and Evan McNeely (Norco) riding up a category with the Elite men. Michael van den Ham is the likely favourite. 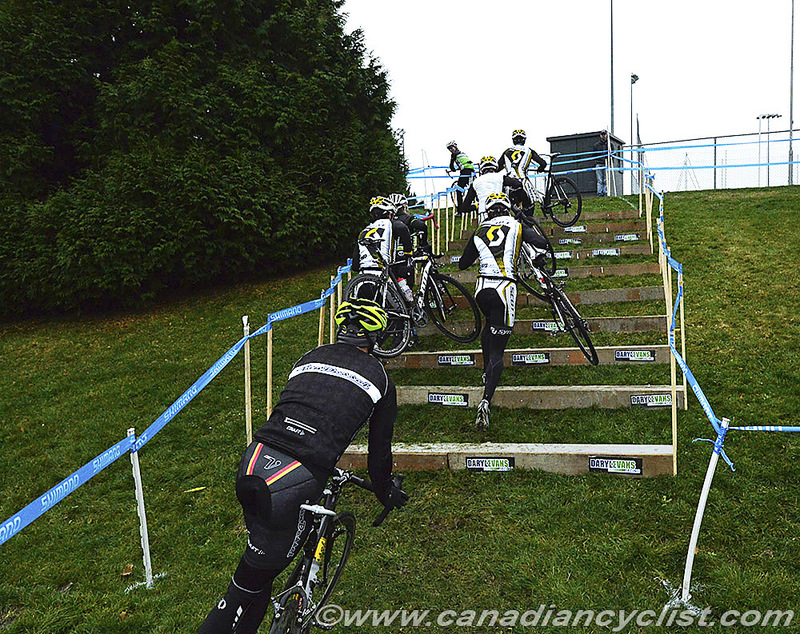 The Elite men have a very strong field, with only Raphael Gagne (Rocky Mountain) and Chris Sheppard missing. This is likely to be a battle between the Scott-3Rox squad led by Kabush and Derek Zandstra, and Aaron Schooler's H&R Block team. Team Norco could be a spoiler, with Andrew L'Esperance, Andrew Watson and McNeely. Other names to watch include Mike Garrigan, Craig Richey and Derrick St John. As an interesting aside - Kabush is running a pair of Scott Addict carbon bikes that weigh in at an astounding 15.1 pounds (6.84 kg) each. Both frames have be modified from mechanical to electronic Shimano Dura Ace Di2. One is with a double chainring with the rare 46 tooth Dura Ace pro ring, the other with a modified single ring. For the Elite women, Luna's Catharine Pendrel is the one to beat, since the pro mountain biker has been extremely strong all Fall. Others who will be looking to podium include Sandra Walter, defending champion Mical Dyck, new Luna signing Maghalie Rochette and Natasha Elliott. An interesting name on the start list is Road Olympian Denise Ramsden. 2011 champion Emily Batty is absent. Our coverage starts tomorrow with the Masters categories, starting at 10:00 am local (1:00 pm EST), follow on Twitter @cdncyclist.. The Elite women start at 2:00 pm local (5:00 pm EST) and the Elite/U23 men at 3:15 pm local (6:15 pm EST). Judging by daylight today, the men will be finishing in dusk conditions.